With an endeavor to create a future without hunger, Secretary-General Ban Ki-moon today has launched a ‘Zero Hunger Challenge’ which challenges all countries to work for a future where every individual has access to food and adequate nutrition. At the launching of the initiative at the UN Conference on Sustainable Development (Rio+20) in Rio de Janeiro, Brazil, Mr. Ban says in a world of plenty, no one – not a single person – should go hungry. 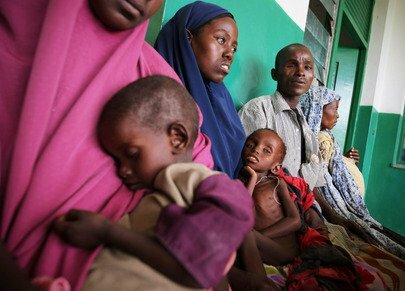 Somalia is gripped by a devastating drought and famine that has already killed tens of thousands and is leaving many hundreds of thousands more, particularly young children and babies, in desperate need of emergency lifesaving humanitarian assistance from the outside world. He notes that “Zero hunger would boost economic growth, reduce poverty and safeguard the environment. The initiative would foster peace and stability, he added. Mr. Ban urges alls farmers, business people, scientists, civil society and consumers to join the challenge by work together to put an end to hunger. The ‘Zero Hunger Challenge’ has five main objectives: to achieve 100 per cent access to adequate food all year round; to end malnutrition in pregnancy and early childhood; to make all food systems sustainable; to increase growth in the productivity and income of smallholders, particularly women; and to achieve a zero rate of food waste. The ‘Zero Hunger Challenge’ is backed by UN Food and Agriculture Organization (FAO), International Fund for Agricultural Development (IFAD), World Food Programme (WFP), UN Children’s Fund (UNICEF), the World Bank and Bioversity International. More than 40,000 people including heads of State and government, parliamentarians, mayors, UN officials, business and civil society leaders attended Rio+20. It seeks to shape new policies to promote global prosperity, reduce poverty and advance social equity and environmental protection. In October 2011, the United Nations and the United States Peace Corps signed an agreement to cooperate in combating worldwide hunger by increasing food security in the 76 countries where the more than 8,600 US volunteers currently work. The agreement, signed by the UN Food and Agriculture Organization (FAO) and UN World Food Programme (WFP) at their Rome headquarters, builds on years of cooperation with the 50-year-old US organization. FAO and the Peace Corps have a long history of working together in rural communities throughout the world. This agreement signals a renewed, enhanced commitment to harnessing the respective strengths and expertise of our three organizations to tackle the root causes of hunger and ensure sustainable food security and economic development. WFP is the largest humanitarian agency fighting hunger worldwide. Each year, on average, WFP feeds more than 90 million people in more than 70 countries.